WEST LAFAYETTE, Ind. — Surgeons of the future might use a system that recognizes hand gestures as commands to control a robotic scrub nurse or tell a computer to display medical images of the patient during an operation. Both the hand-gesture recognition and robotic nurse innovations might help to reduce the length of surgeries and the potential for infection, said Juan Pablo Wachs, an assistant professor of industrial engineering at Purdue University. The “vision-based hand gesture recognition” technology could have other applications, including the coordination of emergency response activities during disasters. “It’s a concept Tom Cruise demonstrated vividly in the film ‘Minority Report,'” Wachs said. Surgeons routinely need to review medical images and records during surgery, but stepping away from the operating table and touching a keyboard and mouse can delay the surgery and increase the risk of spreading infection-causing bacteria. The new approach is a system that uses a camera and specialized algorithms to recognize hand gestures as commands to instruct a computer or robot. At the same time, a robotic scrub nurse represents a potential new tool that might improve operating-room efficiency, Wachs said. Findings from the research will be detailed in a paper appearing in the February issue of Communications of the ACM, the flagship publication of the Association for Computing Machinery. The paper, featured on the journal’s cover, was written by researchers at Purdue, the Naval Postgraduate School in Monterey, Calif., and Ben-Gurion University of the Negev, Israel. Research into hand-gesture recognition began several years ago in work led by the Washington Hospital Center and Ben-Gurion University, where Wachs was a research fellow and doctoral student, respectively. He is now working to extend the system’s capabilities in research with Purdue’s School of Veterinary Medicine and the Department of Speech, Language, and Hearing Sciences. A scrub nurse assists the surgeon and hands the proper surgical instruments to the doctor when needed. The Purdue researcher has developed a prototype robotic scrub nurse, in work with faculty in the university’s School of Veterinary Medicine. 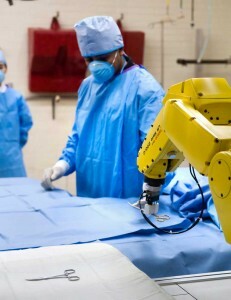 Researchers at other institutions developing robotic scrub nurses have focused on voice recognition. However, little work has been done in the area of gesture recognition, Wachs said. “Another big difference between our focus and the others is that we are also working on prediction, to anticipate what images the surgeon will need to see next and what instruments will be needed,” he said. Wachs is developing advanced algorithms that isolate the hands and apply “anthropometry,” or predicting the position of the hands based on knowledge of where the surgeon’s head is. The tracking is achieved through a camera mounted over the screen used for visualization of images. The hand-gesture recognition system uses a new type of camera developed by Microsoft, called Kinect, which senses three-dimensional space. The camera is found in new consumer electronics games that can track a person’s hands without the use of a wand. “You just step into the operating room, and automatically your body is mapped in 3-D,” he said. Accuracy and gesture-recognition speed depend on advanced software algorithms. Use a small vocabulary of simple, easily recognizable gestures. Not require the user to wear special virtual reality gloves or certain types of clothing. Be as low-cost as possible. Be responsive and able to keep up with the speed of a surgeon’s hand gestures. Use gestures that are easy for surgeons to learn, remember and carry out with little physical exertion. Be highly accurate in recognizing hand gestures. Use intuitive gestures, such as two fingers held apart to mimic a pair of scissors. Be able to disregard unintended gestures by the surgeon, perhaps made in conversation with colleagues in the operating room. Be able to quickly configure itself to work properly in different operating rooms, under various lighting conditions and other criteria.